When it gets hot in southern Arizona, there’s an easy escape. All around are “sky islands,” which are mountains that pop up from the desert to reach cool air high up in the atmosphere. 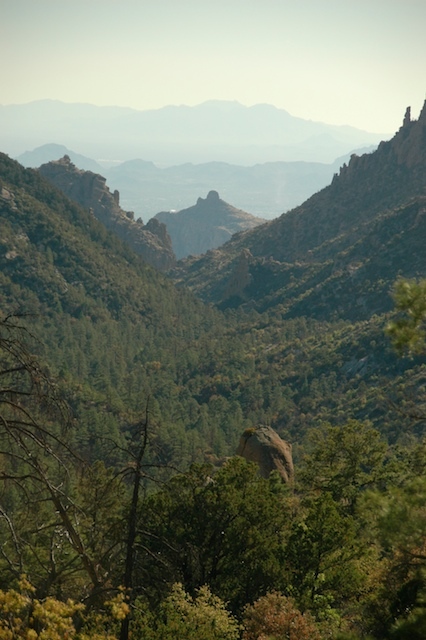 Some, like the Santa Catalina range just to the north of Tucson, are easily summited by car, and there are campsites dotted all over the National Forest lands. Most of the campgrounds are tight for our 30-foot Airstream, but we’ve been wanting to use our tenting gear anyway. A couple of weeks ago we took the little Honda and scooted up the Mt Lemmon Highway to the General Hitchcock campground at 6000 feet elevation. This little campground has only about a dozen sites, all tucked into a small canyon and shaded by towering Ponderosa pine trees. It seems much farther from Tucson than it really is. On a day when the air was scorching the desert sand in Tucson, the camping at General Hitchcock was just fine at about 15 degrees cooler. 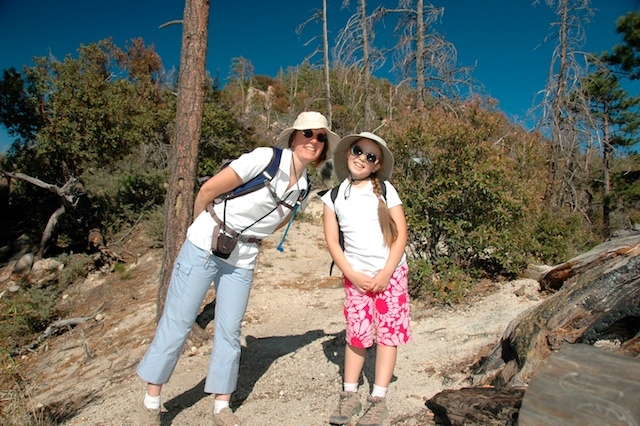 From any campground in the Santa Catalinas, you can find a hiking trail. From General Hitchcock the Green Mountain trail ascends 1.8 miles to a saddle near Guthrie Mountain, and along the way you can get a spectacular view all the way back to Tucson with the famous “Thimble” in between. The climb is occasionally steep. You have to go further than the saddle to get a summit view, but we were not hiking with the goal of bagging peak on that day. Our goal was just to get a hike in and then return to camp to set up for the evening. Kids always seem to like tenting, and so do I. There are always things to do: setting up the tent, unpacking the bedrolls, fetching water, cooking, and all the other little simple tasks that kids can help with. In addition to the jobs, there are bugs and critters to discover, rocks to climb, and running around to be done. Everything’s an adventure in a forest campground like this one. 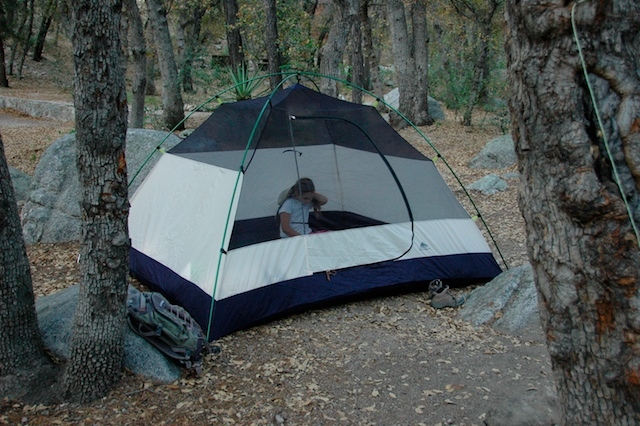 Adults have to remember how novel the tenting experience is for a kid. Sleeping outdoors! In a tent! With Mom & Dad right there, to talk to, and play checkers, and explain the strange night sounds. Nothing to fear, all the comforts a kid really needs, and plenty of opportunity to learn from each other. Even after three years of life in our Airstream, tent camping is still fresh and exciting for all of us. Personally, I like all the neat gear. 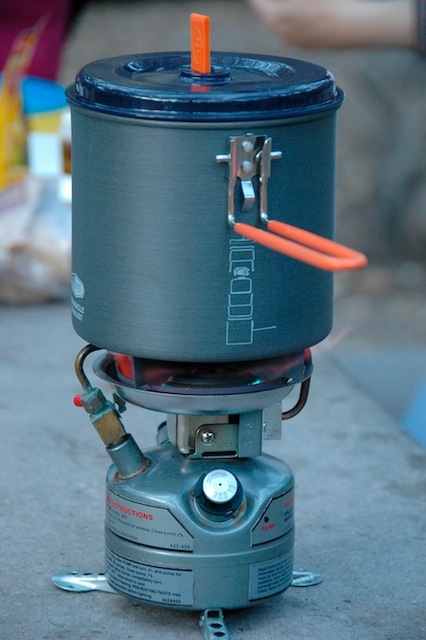 It just tickles me to fire up my little camp stove and boil some water for dinner. Don’t know why, but it’s fun. I left the rain fly off the tent so that we’d be able to see the stars. The chance of rain was absolutely zero. Because we were above the dust layer that often covers the low desert, we could see brilliant glowing of constellations all night through the trees. Owls hunted up above, and we could occasionally hear them hooting at each other. My ears got a little chilly when the overnight air cooled to about 50 degrees, but it was worth it for this night of fresh air and the rare experience of sleeping closer to the ground. I know most Airstreamers say that they bought their trailers so that they wouldn’t need to sleep on the ground anymore, but once in a while I still crave the simplicity of the experience. Descending the mountain road again the next day, we passed through an elevation at which the saguaros were at the peak of their springtime bloom. 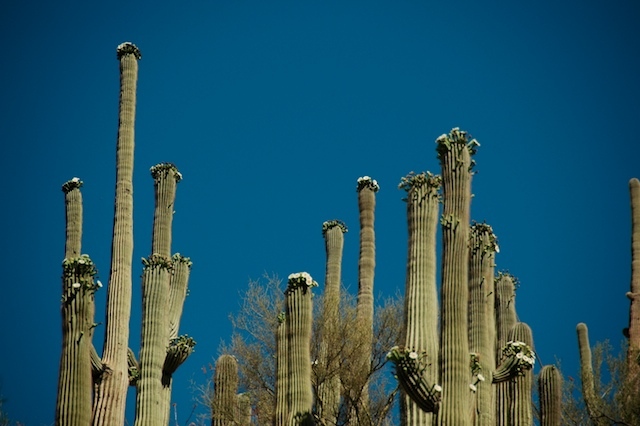 I had forgotten that the saguaros were due to flower at this time of year. 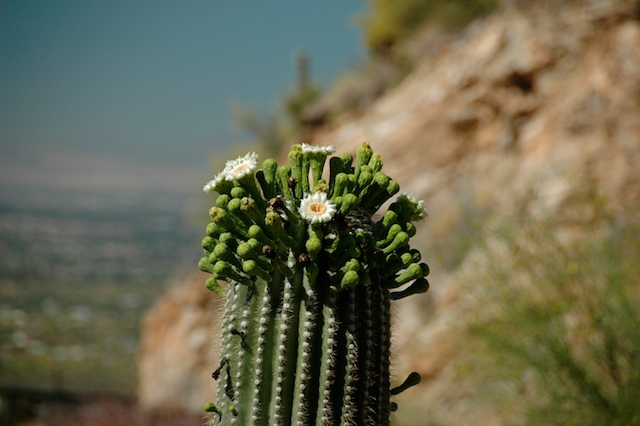 I suppose most people don’t know that they flower at all, seeing as how they are only found here in the lower Sonoran desert. Seeing the spring bloom is one of the little cues that tell us the seasons are changing. It’s not all just hot and dry here … even from day to day the scenery can change, as our little overnight trip to the Santa Catalinas has reminded us. It has been a long hot period in Tucson lately. The heat has struck a bit early, meaning that we’ve had about 10 days straight of 100 degrees. As summer sets in, certain outdoor activities become off-limits, and people begin to seek recreation either inside shopping malls or up in the mountain parks. But I’ve had a certain hike on my mind for three years now, and I was determined to do it before we leave for the summer. As one drives along I-10 between Tucson and Phoenix, a peculiar pointed mountain appears to the west. It appears un-hikeable, by its steep sides and nearly jagged contours. This is Picacho Peak, the site of a state park and a fine campground, which we’ve visited several times. There is a trail that leads all the way to the top, about 2.1 miles each way. 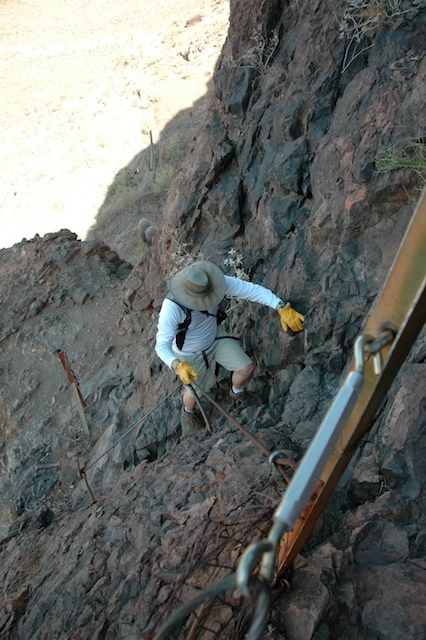 The climb is extremely steep, to the point that many times the only way to ascend is with the help of steel cable lines that have been bolted into the rock. It is really more of a “climb” than a hike. The steepness of the climb dictates that people with very short legs (a.k.a. Emma) can’t make the climb without assistance. And people with any sense at all (a.k.a. Eleanor) quickly realize that a climb like this on a day that is destined to hit 100+ is moderately insane. Fortunately, Brett had flown in from Denver for the weekend, so I had a like-minded (meaning “equally soft in the head”) companion. So Brett and I left the house at 6:30 a.m., alone, in an attempt to reach the summit before the temperatures spiked as sharply as the peak itself. We completely failed in one respect. The temperature was already well into the 80s at 7:45, when we reached the trailhead (50 miles from Tucson). By the time we finished it was over 100 degrees. 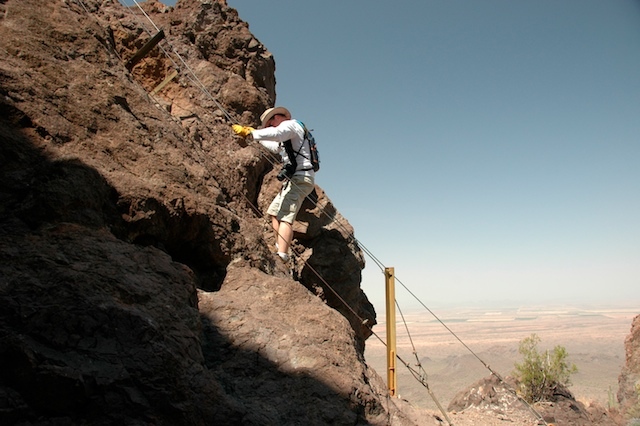 More than half the trail is completely exposed, with no shade, and the heat of the sun bakes the steel cables to the point that they can burn your hands. But along the way, the trail rewards you with spectacular views, which help distract you from the minor discomforts. Of course it helped that we were prepared for the trail with leather gloves, broad sun hats, white shirts, SPF 55 sunscreen, hiking shoes, energy snacks, and lots of water. Water is the big thing. Brett brought 70 ounces of water in his backpack, and ran out about midway through the return descent. I brought 100 ounces and ran out at the very end of the hike. All of that water was evaporated through our skin — there were no bathroom stops during the 3.5 hour roundtrip. (Yes, in case I didn’t make the point with my previous post, the air is very dry here.) Ill-prepared people would not be able to complete the hike in these conditions, at least not without suffering. We groused about the steepest sections, but really, it was a fun adventure. My advice to others would be to hike this peak between November and April, like a sensible person would. It’s tough enough to make you realize you really did something, and yet manageable by most people with good fitness. Bring the Airstream and camp in the park to double your pleasure. It’s worth the effort. 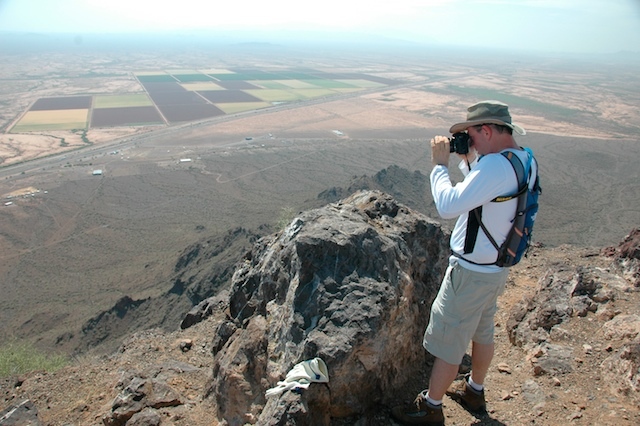 I can’t think of another small mountain climb quite like Picacho Peak. We are here in Tucson, far beyond the normal window of snowbird activity, because I wanted to stay and get a taste of Tucson’s heat after a cool winter. Our Airstream travels will not resume until June. In the weeks between now and departure, there lie at least 15 days of temperatures exceeding 100 degrees. But I did want to be here for the heat. Unlike most people, I like it, at least when it’s the famous dry heat of the southwest. We started reaching the upper 90s about a week ago and for the past three days we have flirted with 100 every day — reaching 99.5 in the shade of our back patio this afternoon at 4 p.m. But although the weather service has claimed an official temperature of 100 today, I won’t say the ice of the Santa Cruz has broken yet, at least not according to the Luhr Standard Temperature Gauge. It’s not nearly as unbearable as it sounds. The mornings are gorgeous, running in the mid-60s. We get up at 6 a.m. or so (even a shade doesn’t fully stop the sun from screaming in our eastern bedroom window), and open all the windows wide to catch the cool morning air and the sounds of the birds. By 8 a.m. it has reached 72-75 degrees and we shut the windows again, and await the mid-day when the central air conditioner kicks on to keep the house at 79. By then, the outside temperatures are well into the upper 80s, and the searing heat of the afternoon lies in wait. We have learned self-defense techniques, of course. Anything to be done outside, such as planting or bicycling, gets done in the early morning. We never go out without a bottle of water, sunglasses and a very breathable broad sun hat. I am wearing super-cool white shirts most days. The black seats of the car are never scorching since the car sleeps in the shade of the carport, and there is nowhere it can go in the afternoon that isn’t air conditioned. Beating the heat, it turns out, is much easier than beating the cold of a New England winter — and we don’t have to shovel the sunshine out of the way before leaving the house. Heat, of course, is energy. We are gradually finding that the energy is useful in ways that most people ignore. I’d like to have solar electric panels on the roof of the house, as we do on the Airstream, but that project will have to wait until 2010. In the meantime, the house came with an old-fashioned clothesline, and Eleanor has discovered that it does an impressive job of drying towels, which saves the energy the dryer would consume. The trick is to get them off the line before too long. She put a set of towels out there today and they came back not only dry, but rather crispy. 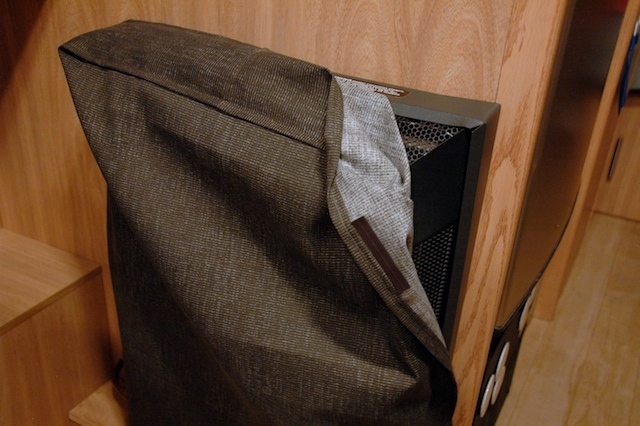 The combination of dry air, sunshine, and heat puts the gas dryer to shame. Tonight we are grilling salmon on the little Weber. The salmon was frozen solid, but Eleanor simply tossed it out on the weeds of our back yard (still sealed tightly in the original plastic package) and in about 30 minutes Emma flipped it. Less than an hour later, the fish was perfectly defrosted. 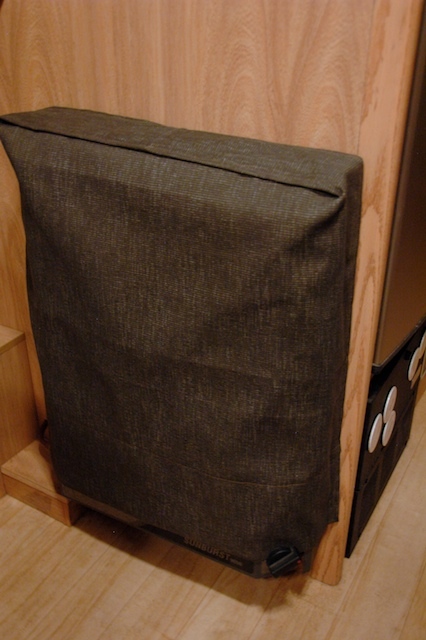 I brushed the weed debris off the package and put it in the refrigerator. Much longer and it would probably have started to cook. Who needs a microwave when you’ve got Arizona sunshine? The other aspect of our current climate is that this is the dry season. I mean d-r-y, like Easterners have never experienced. As I write this, the relative humidity is 6%, which is not unusual at all. Hydration of humans and plants is the key to survival, so we (and most people who live here) keep a water bottle within reach at all times. Eleanor has discovered that tomatoes left on the counter in a breathable package here will not go rotten, but they will slowly dehydrate. While they were gone I found a pack of tiny “grape” tomatoes that had been here for who-knows-how-long, and they were still perfectly edible. A bit wrinkled, but tasty — almost like sun-dried tomatoes. Apparently, we live in a food dehyrator. Of course, the amusement of extraordinary heat would be lost if not for the miracle of central air conditioning. We’ve never used our air for more than a few weeks, since we are not normally here for much of the warm season. A setback thermostat and judicious use of natural air for morning cooling will help, but I’m still not looking forward to May’s electric bill. If we were here in the summer I’m sure we would encounter sticker shock, but we’re just summer poseurs — we won’t be here for the long slog. Perhaps in a month I’ll be eager to escape the heat, but probably not. I am sure I will be pining for the dry air later this summer. There is something about life in the desert that appeals to me. The heat isn’t just an obstacle, it’s an interesting aspect of being here. It is the reason that we have lizards in the bougainvillea, and all sorts of other fascinating life. We’ll absorb the heat while we can, in case we encounter a cool and rainy summer again in the northeast. Today Eleanor and Emma return home. For me, this is spectacular news, since they’ve been gone 11 days and I’ve missed them. Of course, it would have been even better if they had returned yesterday, when they were scheduled to fly back. But airlines and airports and thunderstorms in Newark collaborated in that way they do, so that instead of flying back, they spent four hours in the Burlington, VT airport idling. After several changes of departure time because of traffic control delays in Newark, the final straw came when it was announced that the Dehavilland Dash-8 turboprop had a flat tire. As Dad always says, “Time to spare, go by air!” Jet travel is convenient, but there are times when I’d rather hitchhike across the USA than go to the airport. Fortunately, I have an Airstream, and that’s waaaaay better than hitchhiking. For us, travel by Airstream has been a relatively recent discovery. We only started in 2003 (and I was so inspired by it that five months later I quit my job and started Airstream Life magazine). The joy of slower travel in our own rolling home was a revelation, which literally changed our lives. But the principles underlying why it is so much better are nothing new. Travelers have roamed Europe for hundreds of years in rolling caravans, of which the horse-drawn gypsy vardo is but one example. Within a short time after the arrival of motorcars, people discovered that they also provided a great travel experience. What was more logical than to take a motorcar and a vardo, and put the two together? Everyone who travels by RV (whether motorhome, travel trailer, or pop-up) is participating in a great tradition that goes back hundreds of years. And believe it or not, the excitement you feel and the convenience you enjoy in your modern RV today have been identically enjoyed by many generations before you. Want proof? Check these quotes from the book “Motoring Abroad,” by Frank Presbrey, published in 1908. (Google books excerpt here. “There is a great advantage in traveling by motor car abroad. One is not a slave to exacting time tables. There is no dyspepsia-breeding nervousness over this or that annoyance of travel by railway; there are no hurried meals, no hustling porters. The car-window views which you have of the country when riding in a train are exchanged for a wide view on all sides. “One of the particular delights of touring in an automobile is that one may indulge to the fullest extent in what might be termed haphazard decisions. Sudden whims to change the route or to visit this place or that may be indulged without the annoyance of exchanging or redeeming railway tickets. If you happen to be passing through some little village that strikes your fancy, or chance to come across an inn which looks particularly inviting, you do not have to ask the conductor for a stop-over check, nor hurry to the luggage van to get your luggage out. You may stop at will and start at will. “If there is anything which robs a trip of much of its pleasure it is a slavery to an itinerary and a time table. To go and come at one’s own sweet will is productive of far more pleasure, rest and enjoyment than to follow some one’s else [sic] itinerary, whether it is the ‘man from Cook’s,’ the man who makes the railway time tables, or the man who drives a stage coach. Well, that sounds just like most of my reports from the old Tour of America blog. We spent three years looking out the window and traveling with very few definite plans. I think Mr. Presbrey would like traveling by RV if he were around today.